Ideally, tree pruning should be done on young trees to encourage healthy, strong growth. Of course, that’s not always practical and that’s why we use different methods to prune trees. The first step for the professionals at Rich Tree Service is a free inspection of your trees. Elevating: Some trees have branches that are simply too low to the ground. Removing bottom branches provides clearance for walkways, lawn mowing, and provides more light for grass and shrubs. Thinning: While shade can be terrific on a hot summer day, sometimes a tree can block too much light. Perhaps you have a pool and want more sunlight on it. We’ll trim it properly to give you the light you want while still keeping the tree healthy. Thinning also allows wind to blow through the tree instead of snapping branches or toppling the tree. Crown reduction: If a tree has grown too large for its permitted space, crown reduction pruning, may be a viable alternative to removal. When done properly, it lowers the overall height. This approach is best for ornamental trees such as plum, dogwoods, cherry and pear trees which may have been planted too close to a house. Topping: Tree topping, like crown reduction dramatically reduces the height of the tree but can cause quite a bit of stress to the tree (This should be a method of last resort). In some cases we may recommend removing the tree and replacing it with a younger tree. Regardless of the type of pruning we use, the health of the tree is important. And in that regard, we will never use a method of climbing called spiking. 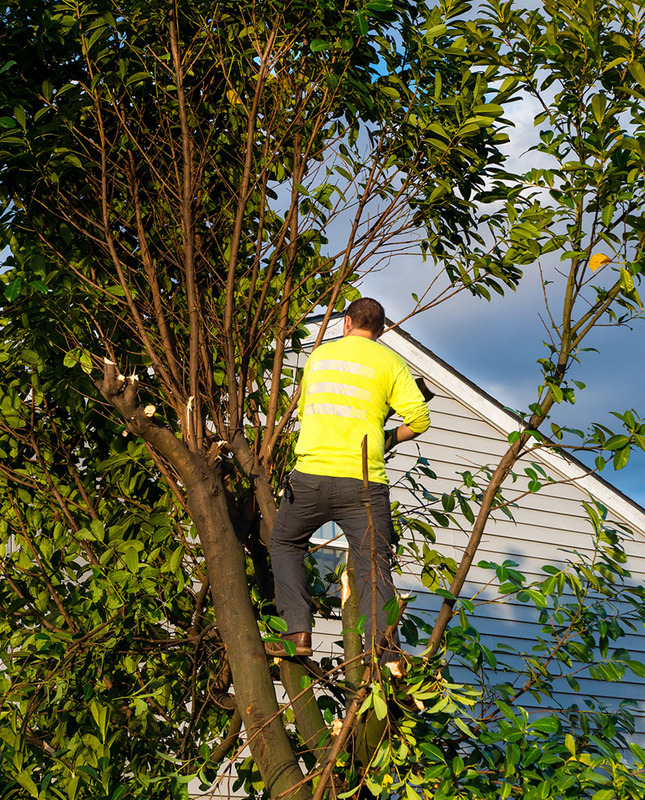 Spiking entails the use of metal spikes to climb the tree and reach the areas that require pruning. The result is damage to the tree that over time can allow insects or disease to weaken and kill the tree. The only instance Rich Tree Service will use this method of climbing is when the tree is being completely removed. Dead Wood: Some trees may drop dead branches. While you may think that tree needs to be removed it may benefit from pruning instead. Many trees should be pruned every two to five years depending upon the variety and health of the tree. Pruning is subjective from one customer to another. Your expectations will be discussed at the time of our inspection. All possibilities will be discussed with you during your free inspection.